So here's one for the exobiologists: is it possible that the remnant of a deceased star (white dwarf, pulsar, etc.) could put out enough energy to support some form of life? Or... what about life developing supported by the energy of a longer-lived star, in a binary star system that's shared with the remnant of another, shorter-lived star that already went kaboom? I think that the people on the planet whose star blew up probably had an OMG moment...but only for a moment. Maybe Milo's right and sometime in the distant future an new world will develop with new people on it. Don't be so sure about that "only for a moment" bit. Stars don't just explode suddenly without going through death throes. Even supernovas take multiple months to reach peak brightness and then to die off forever. Mind you, "multiple months" is the blink of an eye on an astronomical timescale. Stars that are too small to make supernovas will extinguish even slower, going through some quite elaborate struggles until they finally expire. The latter is what this star is going through - note it's described as coughing up dust every 800 years. In fact, all inhabited worlds are likely to be around stars too small to go supernova - the maximum lifespan of a star large enough to go supernova is a little under the time it took us to evolve multicellular life. None of this should prevent us from terraforming such solar systems, if we can reach them. Even these shortlived stars will still last longer than all of human civilization so far. Still, this means that the only sentients with the misfortune to face an actual point-blank supernova are likely to be ones that have the technology to evacuate to a different star beforehand. Ramscoop heaven? It would allow fast easy travel between stars created by such expanding clouds. "So here's one for the exobiologists: is it possible that the remnant of a deceased star (white dwarf, pulsar, etc.) could put out enough energy to support some form of life?" Err...A hot giant with life that depends on absorbing IR energy that develops shortly after the star puffs out its clouds? "Or... what about life developing supported by the energy of a longer-lived star, in a binary star system that's shared with the remnant of another, shorter-lived star that already went kaboom?" a)Destroy its partner or fling it into space. b)Be too small to affect much the solar system. But still wipes out all planets and vaporizes gas giants. Astronomers are searching for a red giant remnant with one or more planets, so they at least consider the possibility likely. 1) Red Giant with a close, dim companion. When the nebula is formed enough material is drawn into the companion that it "levels up". Combined light of fading white dwarf and new brighter star produce a habitable zone. 2) Red Giant orbits in the outer edge of the central galactic bulge of a inactive galaxy. Starlight from the core plus infrared from the remnant are enough to produce a habitable zone. Concerning the star in the picture; the spiral is continuous, indicating continuous mass loss. 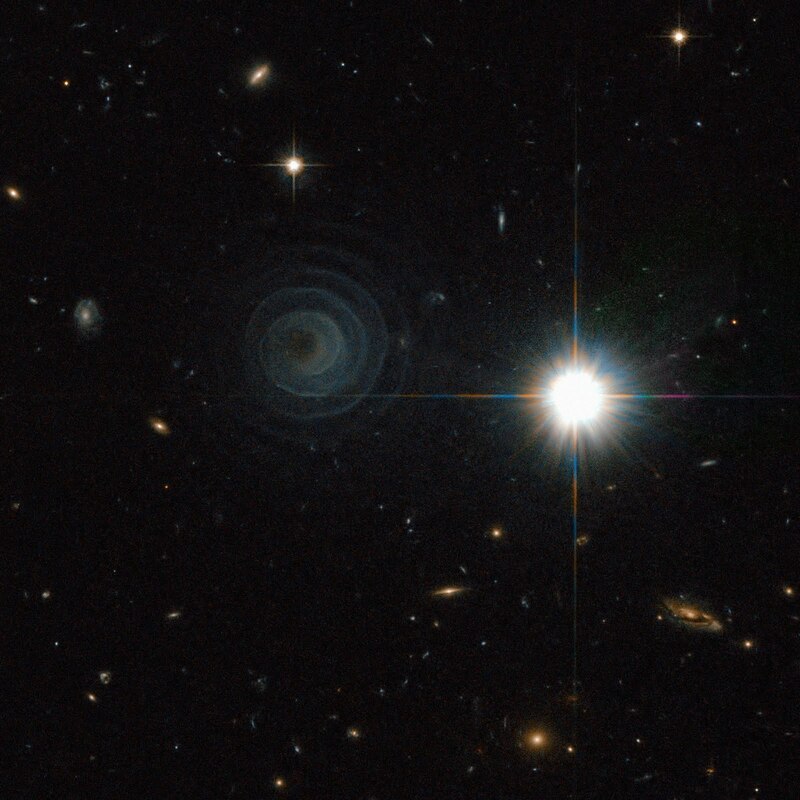 The 800 year pattern in the nebula's spiral is caused by the rotational period of the binary. Has anyone found any indication what the binary companion is like? If it is a main sequence star with a planetary system the red giant wouldn't put much extra heat on to a hypothetical habitable planet, since an 800 year period corresponds to a separation of almost 100 AU. Is there any way the outflow from the dying star could make life difficult on planets of its companion star? Red giants only last a few million years - you aren't going to see life around those, unless it's life that was present before the star sputtered out and managed to keep around despite the rapidly changing conditions. The question is what happens after the red giant has collapsed into a long-lived white dwarf. Finding planets around a red giant would, of course, still be good, since it would imply that at least the rocks survived the initial calamity, and will probably still be there when the red giant collapses. "Is there any way the outflow from the dying star could make life difficult on planets of its companion star?" Tidal forces are disturbed, solar wind increases exponentially, flares from compagnion star become erratic and much more powerful...all depends though on how far away the dying star is and how large it was in relation to its compagnion star. With this picture and knowing that supernovas trigger local stellar birth, is it possible that said newly born stars would be close enough for travel between them under a year at 0.3c. "This assumes ramscoops exploiting locally hydrogen-rich space..."
And not rendered impractical by drag in all that relatively high density gas, or inable to sustain fusion due to the composition of the interstellar medium. "And not rendered impractical by drag in all that relatively high density gas, "
I'll assume speeds which in which drag is much lower than thrust. Mathematically, drag can never become bigger than a 1:1 ration. Of course, this is also assuming that the winds ejected by the dying sun are not relativistic, so much so that a ramscoop would become a dinghy manoeuvering upwind a hurricane. "or inable to sustain fusion due to the composition of the interstellar medium." "I'll assume speeds which in which drag is much lower than thrust." You have to anyway. The point I was making was that a thicker interstellar medium might not be "Ramscoop heaven", since the added drag would probably balance out the more plentiful fuel/reaction-mass supply. Also, a ramscoop might not be able to sustain a high enough thrust to overcome the drag, through simple physical limitations on the machine's maximum safe thrust. "A ramscoop uses ionizing lasers and magnetic fields to control the flow of gas into its mouth. We could set it fine enough to only let in hydrogen, while helium and oxygen have much more momentum so punch through the fields....It could also be set to maximum capture, increasing drag exponentially and, much like a sailing ship, ride the interstellar wind..."
I presume you actually mean inertia and not momentum, since at relativistic velocities gas molecules moving at even thousands of miles per second are practically standing still, compared to the spaceship. And you still have the problem that you cannot exert such fine control over the strength of the collection field. Ions directly to the front of the collector and even some within a a few tens or hundreds of kilometers of the centerline would still be captured. If enough of them are of the wrong types, they could poison the fusion reaction in the engine, or at least seriously degrade it's efficiency by absorbing neutrons. In order for a planet to receive a Mars-like level of solar radiation from Sirius B (which I assumed is a typical white dwarf), it would have to orbit at about 11.4 million km. Unfortunately, this is much closer than even Mercury orbits (69.8 million km), so our hypothetical planet would be roasted for millions or billions of years when its sun was still a main sequence star. When the star became a red giant, our planet would be swallowed into the star's atmosphere. (this will happen to Mercury, and maybe even Venus). I think our best bet for living in orbit around a white dwarf would be to find a planet that migrated inwards after the star collapsed. How close can stars light up next to each other without distrupting too much planet formation? If they are close enough, I see a local system composed of a several stars (5-15) much like a sci-fi version of the Bahamas: Island Hopping in SPAAACE! Seriously, combined with the concept of a massive interstellar wind going through all those solar syetms, we could have easy solar sail travel in one way, and ramscoop travel going the other way...Think of travel on the Nile as an example. The Ancient Egyptians used wind power one way, and rowed the other way. Think about it. "Seriously, combined with the concept of a massive interstellar wind going through all those solar syetms, we could have easy solar sail travel in one way, and ramscoop travel going the other way...Think of travel on the Nile as an example. The Ancient Egyptians used wind power one way, and rowed the other way. Think about it." "[M]assive" is a relative term when talking about stellar "winds". You're still speaking about a better than industrial grade vacuum, maybe even better than lab grade. If you want to rely on the particle flow for transportation, even in dense regions plan on taking several thousand years to get where you are going. "How close can stars light up next to each other without distrupting too much planet formation?" If you're talking about a multiple star system, there is no theoretical limit, but more than two or three stars in a system is unlikely. Also, even binary stars have been postulated doing unpleasant things to planets, so stable planets around more complicated systems is quite questionable. There are other things like globular clusters that can cause many more stars to be unusually close to each other without being in a single multiple star system, but while pretty, these are even less likely to be of interest - they tend to have low concentrations of heavy elements, and they tend to disrupt planet formation. "If they are close enough, I see a local system composed of a several stars (5-15) much like a sci-fi version of the Bahamas: Island Hopping in SPAAACE!" We already have island hopping in travelling between different planets, or even different gas giant moons. Or between different gas giants, each with their own set of moons. Incidentally, an alien species that evolved on the moon of a gas giant would have a much easier time developing early "manned" space travel - they'd have a lot more destinations of potentially more interest within plausible reach of Apollo-type programs. Solar wind doesn't extend into interstellar space - it ends more or less between the termination shock and the bow shock. I don't know how stellar wind would work inside a multiple star system, but it would probably be blowing in clashing directions - although that might be useful (accelerate on the outbound trip, decelerate on the inbound trip). In any case, I expect the strength of any single star's wind will be governed by its size, so it'll only go so large. Another thing is that intense solar wind would tend to strip off planets' atmospheres faster. Down here, Mars already lost the struggle against Sol's wind. Solar wind will be a very weak source of thrust regardless. I doubt it will ever be capable of supporting manner travel without implausible large sails. Actually something like Turbo10k's idea looks better to me than to lobor255. The solar wind moves outward from the sun at aout 400 km/s & some sort of magnetic sail would give an acceleration of about 1 mm/s^2. So assume a multiple star system with distances in the range of 50 to a few hundred AU so planets can orbit in the habitable zone of each star without orbits being disrupted by the gravity of the companion stars. Use a magnetic sail to accelerate away from one star toward another star in the system & decelerate against its stellar wind. A few BOTE calculations tell me that travel times between stars in such a system will be several years. Oh, and with no theoretical limit to multiple star systems, I meant no limit to the number of stars found in a system. As for actual distances in such a system, it's generally suggested that these planets should either (A) orbit both stars at a distance at least five times that between the stars, or (B) orbit one star at a distance no more than one-fifth that between the stars. I'm not sure where these numbers come from, so they might be estimates rather than an accurate cutoff. For your fractal archipelago, you'll be wanting (B). (A) gives prettier exotic skies but isn't really that different from orbiting a single sun as far as travel is concerned. There is technically a third option, which is having the planet in the L4 or L5 point of the two stars. However, this is only stable if the two stars have a large mass variation - larger than the ratio between the largest and smallest life-supporting stars. The most you might get is a planet in the Trojan point of a star and a brown dwarf. "So assume a multiple star system with distances in the range of 50 to a few hundred AU so planets can orbit in the habitable zone of each star without orbits being disrupted by the gravity of the companion stars. Use a magnetic sail to accelerate away from one star toward another star in the system & decelerate against its stellar wind." Turbo10k said "5-15" stars in a single system. The highest population systems so far discovered (AFAIK) have 6 stars, such as Castor. Their dispersion is usually in close pairs or triplets, with distances between them several hundred to over a thousand AU. So you have to figure when you're talking > 6 or 7 stars, you're talking about travelling light years, not light hours. 100 AU is about 14 lighthours, and 1200 AU is about 1 lightweek. A lightweek is approximately the limit of what you can reasonably cover with a torchship or ramjet - even at a continuous acceleration of one gee, you'll take 100 days to cover it. 200 days gives you a lightmonth. Ouch. I must have really messed p trying to explain. I'll try better here. won't make a difference because I want a string of star SYSTEMS all being crossed by a lot of interstellar wind. SYSTEMS in capital because what I was suggesting was not lots of stars in a single system, but stars sufficiently far enough to count as being independant (Sol to Neptune and then some before next one starts). "I want a string of star SYSTEMS all being crossed by a lot of interstellar wind." Okay, let's take an example supernova remnant with a pulsar from reality -- the Crab Nebula. Currently, at a maximum extent of 5-8 ly from the center, it is expanding at 1,500 km/sec, or .005 c. And that appears to be sped up somewhat from initial expansion velocity. So, using a magnetic sail of theoretical maximum efficiency, magically unaffected by drag, heading straight out from the nebula center, it would take you at least 1,000 years to travel five light years. Using a practical sail, and having to tack obliquely to the nebula expansion -- because stars are hardly likely to be lined up perfectly along a vector projecting through the pulsar -- it will take multiple times longer than that. BTW, it would be extremely unhealthy to be that close to a supernova when it happens. By the time that the remnant nebula had expanded to a reasonable safe radius, say 20 ly, it would be relatively defuse, maybe 100 particles per cm^3. Now, that's still a hundred times more dense than the average in interstellar space, but it doesn't just contribute to ram rocket fuel density, it also contributes, as previously mentioned, to drag. At a guess, given the highly speculative nature of the technologies in question, luck would be on your side if the balanced out. Tony is absolutely right. I'd also like to point out (not really because it's a big deal, but because I feel a need to keep this post sciency) that you can't have two stars separated by "Neptune, and then some" count as different solar systems unless "and then some" means "an extra light-year or so." Neptune orbits at about 30 AU. The dwarf planet Eris orbits out to about 100 AU. So, unfortunately, I think Alastair Reynolds is right when he assumes in his books that we'll just have to spend decades slogging through interstellar space with fantastically amazing "parametric drives" that can pull 1200 gravities. I solve the problem by saying "Yeah, well, the solar systems are all completely realistic, but I have transversable wormholes." I digress... but we have to talk about something if we're ever going to reach 600 posts. 1 g for a year gets you close to light speed. The outrageously high energy requirements to maintain 1 g for months mean we won't be doing that any time soon, but you don't need > 1 g acceleration for interstellar travel. BTW here is something that shows you're not the only person thinking of using wormholes differently. I think the author should have made the max size of the wormhole smaller if he really wanted it unusable directly, a non-obese person could go through the size specified. "...so the "only thing" that they're good for is siphoning superheated plasma (this doesn't transmit information?)..." As I understand things, quantum mechanically speaking, "information" is anything that can be described quantitatively. IOW, it's anything you can record data about. so even a single proton is information, because it has mass, spin, charge, and a velocity vector. 1 g for a year gets you close to light speed. The outrageously high energy requirements to maintain 1 g for months mean we won't be doing that any time soon, but you don't need > 1 g acceleration for interstellar travel." Remarkable discussion - thanks, everyone! And welcome to another new commenter. Dense young galactic clusters come closest, so far as I know, to Turbo10k's ideal, but unfortunately an operative word is 'young.' Such clusters fall apart early on, stars going their individual ways before their planets have formed. Wide binaries might both have undisrupted planetary systems, with the stars anywhere from a few dozen to a few thousand AU apart. A classic 1 g torchship can go about 100 AU in a month, and about 15,000 AU (0.25 ly) in a year, but it is sadly hard to come up with destinations in that range. Tony: Some sort of 'cold sleep' seems a much more plausible way to solve the crew morale & consumables problems. Hibernation just above 0 °C rather than freezing to keep it within phenomena observed in real biology. If you did have sort of gravity accelerator so a space ship could accelerate at 100's of gs without putting large stresses on the passengers or cargo, I think the main advantage would be shortening the acceleration path rather than the acceleration time. You could send small cargo or passenger capsules from a sort of gun so the 'motor' stays home & can be used many times over & also be more easily maintained & powered. Now that I've done a bit of calculating I get a 4 AU long accelerator at 1500 gs to get up to 1/2 light speed. We'd better somehow make it at least 100s of thousands of gs to keep the accelerator length reasonable. "Sometimes I think it's more fun to come up with technologies that use wormholes for things other than travel..."
If you've only managed to produce microscopic wormholes, then they'd make a good form of communication. Beware, though - unless you have some way to jam it, having an ansible would seriously support unmanned remote-controlled ships, violating Burnside's Zeroth Law. Other fun uses for (slightly larger) wormholes include ducking the laws of thermodynamics by dumping your waste heat back home. Yay, no need to worry about radiators! Yay, you can now hide your infrared signature! "As I understand things, quantum mechanically speaking, "information" is anything that can be described quantitatively. IOW, it's anything you can record data about. So even a single proton is information, because it has mass, spin, charge, and a velocity vector." Yes. More importantly, the mere choice of whether or not to dump plasma through the wormhole at any given moment constitutes information. "It's certainly not necessary, but the difference between taking around 8-9 months subjective to reach .9c (for example), and taking 5-6 hours is significant, in terms of crew morale and consumables, if nothing else. Surviving such high accelerations is another question entirely..."
There is a much more fundamental problem with these relativistic-speed numbers people like to throw about. According to my calculations, when you're traveling at speeds that give a gamma factor of 2 (i.e., the time that passes for you subjectively is half that which someone on your home planet would perceive), you are carrying kinetic energy equal to your mass energy. If you are travelling at a gamma factor of 3, you are carrying kinetic energy equal to twice your mass energy, i.e. what would be released if your entire ship were annihilated against an equal amount of antimatter. This means that even with a pure antimatter rocket of 100% efficiency, you're going to need some horrendous mass ratios to reach speeds where time dilation is going to be particularly useful in cutting down subjective travel times. Where are you getting all that energy from? "This means that even with a pure antimatter rocket of 100% efficiency, you're going to need some horrendous mass ratios"
Staged antimatter beam rockets?! Ouch. "You could send small cargo or passenger capsules from a sort of gun so the 'motor' stays home & can be used many times over & also be more easily maintained & powered." And then you get the problem of aiming something with gamma 3 energy density at a planet, with the latter catching it safely. Humm. "Such clusters fall apart early on, stars going their individual ways before their planets have formed. " Damn. So it's a pipe dream. What about the pulsar jet intersecting the molecular cloud? The jet's vector could drift slightly so it doesn't go too far into the cloud, but energized a wide path for stars to light up. "I'm just a software developer"
"8-9 months subjective to reach .9c (for example), and taking 5-6 hours is significant"
You mean you reach those gamma numbers faster, so subjective time starts slowing down very quickly, right? "I digress... but we have to talk about something if we're ever going to reach 600 posts." "w00t. [software developers are] Way more useful [than astronomers]." I don't know about that. Right now I work on web sites that make money arbitraging between sponsored links and ad clicks. Before that, I worked on Interwebs yellow pages. How many would say that enabling lawyers and insurance agents to advertise is a bright feather in one's cap? "Space Warfare 12 is going to reach 700 soon and the only topic was 'big explosions in SPAAACE!' (after a while I mean.)" It helps if you first picture smaller stuff, like meteor impacts. You know the Shoemaker-Levy comet, the one that blew craters the size of Earth into Jupiter? That was a SMALL explosion. Back to that 1200 g acceleration, that's from a reactionless drive in the book "House of Suns." I think the engine is even more powerful than that, but the inertial compensators or whatever keeps the crew alive are only designed to handle around 1000 g's... so the ship was flying a bit outside of her normal performance envelope. Yes, it's magi-tech. It also happens to be set a cool 6 million years in the future. Ramscoops: In "The Prefect," ramscoops failed miserably as a system of propulsion, but occasionally prove useful when you need a really, really strong magnetic field for some other purpose. "What about the pulsar jet intersecting the molecular cloud? ... I just learnt that our sun was created when a hypervelocity supergiant ploughed through a dust cloud and went supernova not too far away from here..."
As I understand it, supernovas near dust clouds often trigger star formation, but it has more to do with compressing the gas and dust until the gases collapse due to gravity, and less to do with the gases becoming energized. "Yeah, but now we're talking about even bigger explosions in SPAAACE." Those words hurt us hard sci-fi fans! 3How many would say that enabling lawyers and insurance agents to advertise is a bright feather in one's cap?" It's written on the wikipedia page on planet formation that Jupiter and Saturn-sized planets accumulate their mass in only 10000 years. Terrestrial planets take 100 million years. Tell me again how well floating cities fare? "Yeah, but most people aren't awed by a volcano erupting, but form global geopolitics around the power of nuclear bombs. Nature might be big and mighty, but as long as it wasn't human made or triggered, well...isn't as prone to discussion (just to sound politically correct. 'Doesn't souncd as exciting is plain wrong)"
I seriously disagree. Natural disasters are pretty awe-inspiring, particularly the ones large enough to cause global climate disruption... or even major extinction events. Anytime nature throws something that's bigger than our biggest nukes, it gives some pause. Meteors and supernovas are really awesome. Rick even made a blog post about a particularly awesome one. "Can someone also calculate how much habitable area is available on a ringworld type planet." You mean a tidally-locked planet like Gliese 581g? Also remember that it's hard to divide a planet in simply "habitable" and "not habitable" zones - on Earth, rainforests and swamps have more life than deserts or ice caps, but both of the latter still house some pretty cool (and large) animals. "Remember to give good margins as wind and water can carry some of the heat across to the cold side..."
Yes, it can, and on a sufficiently hot planet the dark side may even have liquid surface water. However, this is undesirable, since it still doesn't have sunlight for photosynthesis. You'd rather have your warmth and your light in the same place, rather than on opposite sides of the planet. Deep ocean water will be more or less the same temperature regardless of your planet's conditions. "how much more radiation would affect the ringworld?" Irrelevant. I'm currently convinced the atmosphere will protect you from anything the magnetosphere doesn't. And life there will evolve to cope with whatever amount of radiation is actually present. The real question is whether solar wind would be harsh enough to cause significant amounts of atmospheric loss. Does solar radiation affect the migration of water throughout the planet? If so, we'd see uniformly distributed water amass and freeze at the dark side, while the light side becomes a barred desert. PS: Maybe I should catch up with Goldilocks planet and write this there. "Does solar radiation affect the migration of water throughout the planet? If so, we'd see uniformly distributed water amass and freeze at the dark side, while the light side becomes a barred desert." I doubt solar wind affects water cycles, but electromagnetic radiation (i.e. light) obviously does - the most obvious effect being that warm seas make more clouds, and the less obvious effects being that temperature influences wind currents that carry the clouds, and determines when they start raining down again. While water would not be seeing much evaporation on the dark side, though, it would have a way of returning to the light side - by flowing back. Even if the dark side's surface is covered in sheets of ice (as I said before: not a foregone conclusions, but both likely and desirable), there will likely be enough heat to support a liquid ocean underneath it (if it's cold enough for the ocean to freeze over entirely, the planet is probably too cold for life even on the light side). This ocean will simply flow back, over the ground, to the light side, where it evaporates again. At least that's my intuition without running actual climate simulations. Ignored here is the question of how rapidly water moves to the dark side anyway - many clouds will rain down before crossing the terminator. "I also see this planet as actually easy to terraform; Big mirrors in space around the equator can concentrate light around the terminator, pointing it at colder areas, or heating up previously uninhabitable areas (past the terminator)." What's everyone's obsession with building giant mirrors? I would rather my terraforming use a minimum of planet-sized, expensive, non-self-regulating, and hard-to-maintain structures. Even dome cities would likely be cheaper than a space mirror that size! If space travel is so cheap and easy that you can afford such whimsies, then it's also cheap and easy enough that you can just settle a whole lot of different planets, putting relatively small colonies on each. We don't even know if the habitable zone would be thin enough to make it worth bothering - thick air can even out temperatures pretty well, especially for a species of sophonts that has already adapted to regions ranging from the Amazon rainforest to the Sahara desert to Greenland on its home planet. my mission right now is to make up my lost ground, and achieve an excellent result for my exams this year, wish me good luck. Good luck, turbo - hope to see you back here once you've brought up your grades!